All of the lead protagonists in the BioShock games have been men. Haunted, lethally determined men. But, thanks to an upcoming downloadable add-on, players will be able to take control of Elizabeth, the AI character who was the focus of BioShock Infinite. Hundreds of thousands of people gobbled up the twisty, surprise-filled storyline of BioShock Infinite right after it came out. But, it's probably a safe bet, that most of them haven't fired the game back up since they finished. Ken Levine and the team at Irrational Games think they have pretty good reasons for those masses to come back. The first is Clash in the Clouds, a new, combat-focused DLC pack that's available starting today for $5. And, sometime in the future, players will get Burial at Sea, a hardboiled adventure set in 1958 where you'll play as both Booker and Elizabeth in Rapture. That's right: Elizabeth will be playable. In Rapture. At the height of the underwater city's beauty. Interested? For months, that Season Pass pane in BioShock Infinite's menus seemed to tease players holding out for the promise of more adventures in the floating, secessionist city of Columbia. When making the announcement yesterday, Levine said that he and his cohorts at Irrational listened to what fans said they wanted with regard to DLC. The add-ons weren't farmed off to auxiliary developers, aren't comprised of content that's already on the disc and aren't a bunch of ideas that were set aside for later use by corporate decision-making. When Clash in the Clouds hits Steam today, it'll be only the first add-on for the well-recieved game. Designed by Infinite's lead level designer Forrest Dowling, Clash in the Clouds puts players against 15 waves of enemies in four all-new maps all across Columbia. Leaderboards will chart how you do against other friends playing these battles and players will earn new achievements and trophies. The extra content also fears new voxaphones for fan-favorite character Rosalind Lutece to flesh out parts of her backstory, as well as new behind-the-scenes video and concept art. 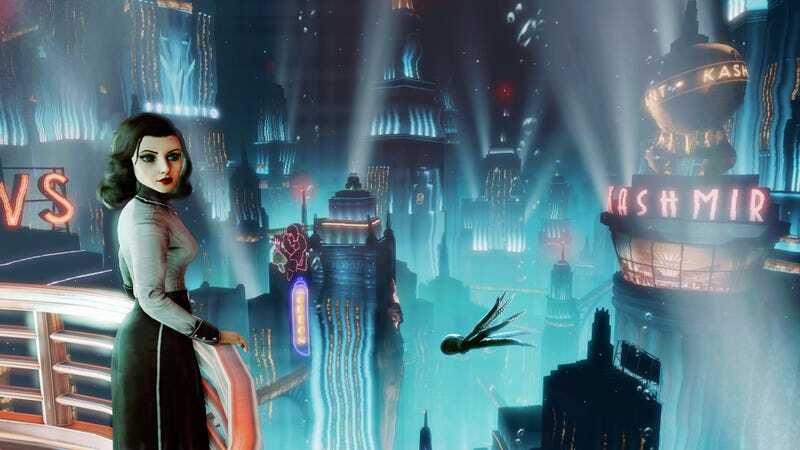 The two-part Burial at Sea will drop the lead characters of Infinite into the iconic city from the first BioShock game, in the middle of what looked like a noir-inflected mystery. Levine promised that you'll be seeing some familiar faces from the underwater city's tortured history. You can see glimpses of Booker and Elizabeth in Rapture in the teaser above. Levine said that making Elizabeth a playable character was another example of giving fans what they wanted. Burial at Sea will cost $20 for both parts $15 each for both parts, and the BioShock Infinite Season Pass is available for $19.99 (1600 Microsoft Points). You'll be able to see more of Clash in the Clouds' gameplay in a video going up on Kotaku later today and we'll have more on Burial at Sea and the future of BioShock in interviews with Ken Levine later this week. Note: please post a warning if you're going to discuss spoilers in the discussions below.